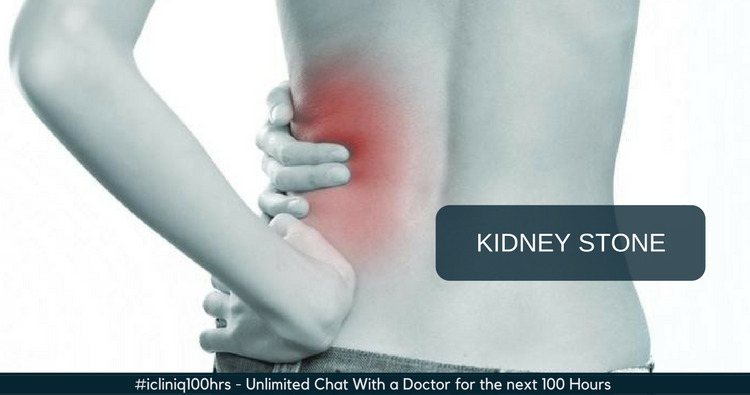 iCliniq › Ask a doctor online › Health Articles › Kidney Health › Diagnosed with Kidney Stone - What Next? Written by Dr. Devendra and medically reviewed by iCliniq medical review team. The anatomy of the urinary system is such that urine formed in the kidney is transported to urinary bladder by a narrow tube called ureter. Size is the limiting factor for natural passage of kidney stone through this narrow passage. Ureter can accommodate around 4 mm diameter stones. For 3 to 4 mm multiple kidney stones, there is a high likelihood of spontaneous passage of the stone. As size progressively increases, the chance of stone getting stuck increases. It requires some procedures to clear the kidney stones. Which medicine is recommended for diabetes instead of Sitaglu Met? Please suggest diet to prevent dialysis and control creatinine level in a diabetic. I have dull pain in my testicle. Can it be blue balls? Regular high fluid intake and healthy physical activity in patients carrying small multiple stones may help in spontaneous passage of stones. But, they need to remain alert to some of the danger signs to seek urgent medical help. Fever, persistent pain and swelling in the kidney due to stone on ultrasound are red flag signs and need very urgent treatment. Infection in an obstructed system manifesting as fever can cause life-threatening sepsis. Persistent swelling in the kidney may progressively damage kidney function if not relieved. Pain due to small stones passing through ureter can be managed medically if no danger signs are present. But, never neglect surgery for stone disease if required as it may cost you the kidney. Do not get worried if recently diagnosed on ultrasound for health checkup with small kidney stones. Likelihood of spontaneously passing a stone less than 5 mm size is 77% whereas for greater than 5 mm is 46%. Interval of the stone passage is highly variable and dependent on the stone size and location. About 40 days are required for stones of 2 to 6 mm in size to pass. Do you have a question on Kidney Health or Kidney Stones? Can I take any medicine to lose weight fast?